Last week included several firsts: my first time separating an egg (and I didn’t drop eggshell into it, or break the yolk, or anything! 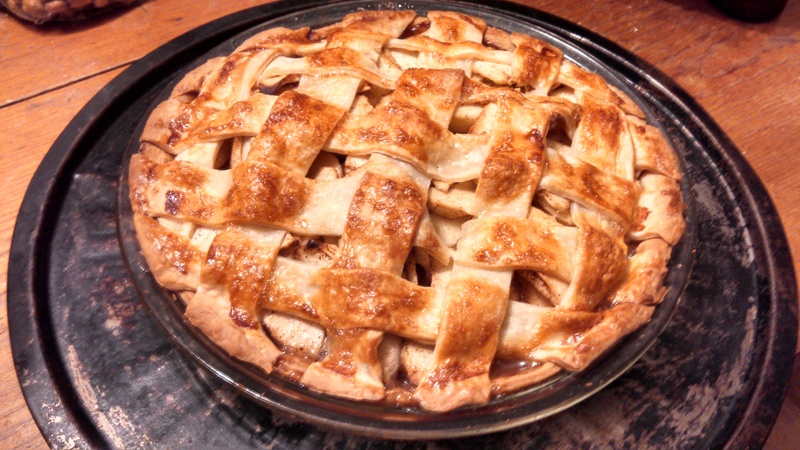 ), my first time weaving a lattice crust (for an apple pie for our “Friendsgiving” at work), my first time making homemade pie crust from scratch, and my first time making my own cherry pie filling. Whew! I did a lot of baking last week, and thankfully didn’t have any major issues. **I had one small problem with a leaky top, but we’ll get to that in a moment. Before I go much further, I want to clarify that not all of my pies were made with homemade crust. I actually tried a variety – one was the pre-rolled type you buy in a box and just unroll on the pie pan. The other was a Betty Crocker mix I just had to add water to, and roll out. I’ve used the pre-rolled type a number of times before, with fairly good results, though I can generally tell the difference between a store-bought and homemade crust. Since I was pressed for time when making the crust for work, I just went with this kind. I did get a little fancy though, and attempted my first lattice crust. It’s a little wonky – I didn’t cut the strips uniform width – but I think it was pretty good for a first try. I brushed on a little egg white before baking it, and it browned nicely. 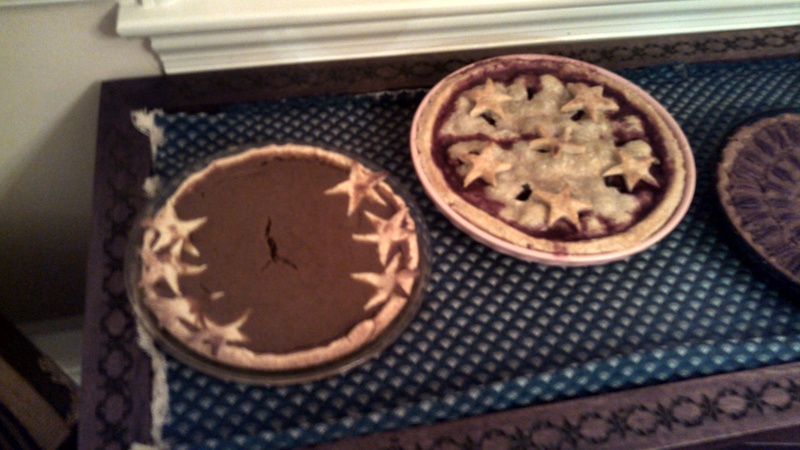 For Thanksgiving, I decided to make two pies: one pumpkin, and one cherry. Even though I was going to use the store-bought mix for the pie crust, I wanted to make the filling myself, and give it a little pizzazz. So I went with this recipe for a pumpkin apple butter pie. I used the last of the apple butter that I made – extra homemade! 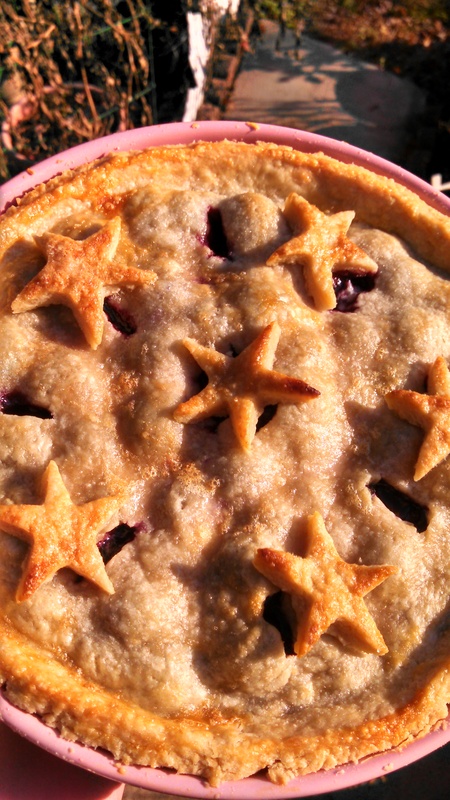 I added a few little pie crust stars around the edge (they kind of sunk into the pie). The pumpkin pie disappeared at Thanksgiving. I guess I found a good recipe! I’ll have to make another one at home, for my folks. 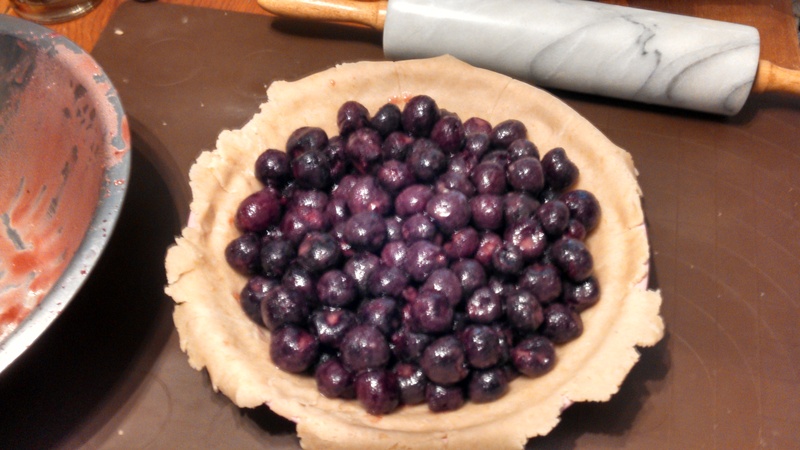 I knew I was going to make my own crust for the cherry pie, using a recipe I found on Your Cup of Cake. Place all ingredients in a bowl. Start with 2 T. water. Use a fork or dough blender, and mix dough until crumbly. Keep adding a little water at a time until you can form a ball with your hands. Make sure you don’t add too much water! Split dough in two and form two balls. Roll out one ball between two sheets of parchment paper. 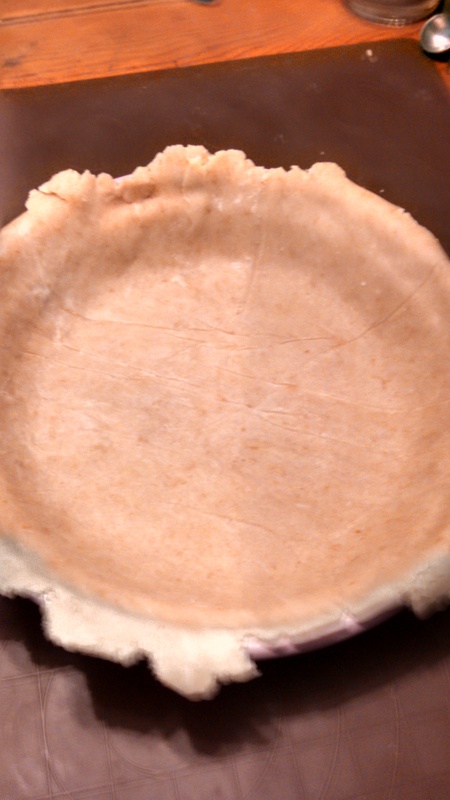 Peel off the top layer of parchment, then gently flip the pie crust onto your pie pan. I had wanted to make the filling myself with sour cherries, but those are very much a seasonal thing, and the Food Lion where I picked up supplies didn’t have any tart cherries in the freezer section. I knew I had cherry pie filling at home (and, let’s be honest, I would probably eat the stuff out of the can if I was allowed), so I went ahead with that plan. Thursday morning, I woke up bright and early and started setting out my ingredients, only to learn that the only stick butter we had was salted, and that Mom was planning to take it down to Richmond, when they went to my aunt’s house that afternoon. I slipped on my tennis shoes and headed down to the grocery store (yes, in my pajamas), in search of unsalted butter. While I was there, I also checked out the freezer section…and, lo and behold, there were a few packages of frozen cherries. These were sweet cherries, instead of the tart ones I was looking for, but I decided to pick them up and see if I couldn’t find a recipe that would work. A short Google search turned up this pie, which can be made with sweet or tart cherries, simply adjusting the sugar levels. I didn’t have any almond extract and didn’t want to go back to the store, so I just put in a little more vanilla extract. I think I put in a little extra lemon, too, and I don’t think it needed it. The recipe does specify that the pie needs to sit 2-3 hours after baking, before you cut into it. Unfortunately, I think it should also sit a while before you try to drive it anywhere in a car. If I had another person in the car with me, who could adjust for the movement of the car around curves, I’m sure it would have been fine. As it was, I was alone in the car and the pie juice filtered out of the vents in the crust, and ruined the pristine top crust. 😦 Good thing I remembered to take a picture, right before I put it in the car! I will note that I had a little bit of an emotional breakdown while preparing for this pie. A number of years ago, my aunt Gidget gave my mom, my sister and I special pie dishes from Longaberger. It’s an Ohio company, and it’s kind of a big deal sometimes, and Aunt Gidget wanted to commemorate the struggle that she and Mom and several other members of our friends and family have gone through, with the pie dishes. It was a perfect gift – I don’t usually use baskets, but I love baking pies, and the pie dish is the perfect size. Every year, the cherry pie goes in that dish. Except…I couldn’t find mine this year. I used it earlier, in summer, to make a tomato pie, but it wasn’t in the cupboard, and it wasn’t on top of the oven, and it wasn’t anywhere else I looked. I was, to be honest, a bit upset and frantic. I wound up using Mom’s dish, so we had cherry pie after all, but I miss my own and will continue the search. I had people do a sort-of blind taste test of the crusts, though it wasn’t as scientific as it could have been. If I wanted a pure test, I would have made two of the same kind of pie, with different crusts. I wanted feedback on the taste of the homemade crust. About half of the people who tasted the two were able to pick out the homemade crust (Robert was the first to tell the difference). It’s not a bad crust…in fact, Dad raved about the cherry pie to several people at church, not realizing I could hear…it’s just not the one I’m looking for. Just what am I looking for in a crust? Flaky but sort of sweet. To be specific, I want to replicate the pie crust from a little place I found in Santa Fe, called the Sweet Lily Bakery. Oh lord, people…that pie was the best pie I have ever had. I told Robert I would live in the pie if I could, and it’s true. Normally, I’m not a big fan of pie crust. A lot of it is there to hold the innards of the pie together, and I’ve had my share of bad pie crust. This crust, however, was life-changing. I happened to get a piece of the strawberry-rhubarb pie when I was there for a conference, and it was the best food decision I’ve made. Except, of course, that the Sweet Lily Bakery is all the way in Santa Fe, and I’m here on the East Coast. After pie time on Thanksgiving, not entirely satisfied with my first crust, I went on a Google search, hoping to find a recipe from Melinda Gipson, the owner of the bakery. I found an article where she mentions she uses flour, butter and cream cheese for her pie crust, so I’m going to make a second crust attempt, armed with that knowledge. 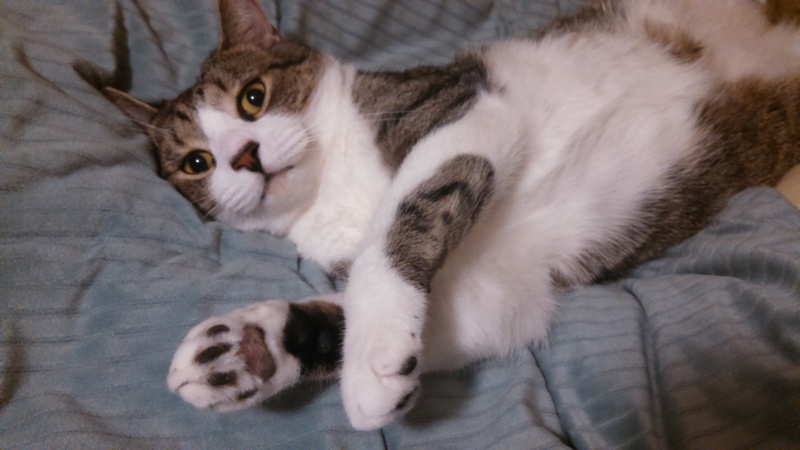 Alvin is thankful for soft blankets, the occasional chin scratch, and an opportunity to steal pie from unsuspecting victims.